Whatever your event – Teas, Balls, Fundraisers – the Alexander Mansion is the perfect place! Weekdays (Monday-Friday Morning): $500 for a 3 hour event. Additional hours are $125 per hour. Weekends (Friday Evening, Saturday, Sunday): $3,000 for a 4 hour event. Additional hours available at $125 per hour. Photographers: You may reserve the Alexander Mansion for a photo session with your client. For example, engagement photos, bridal portraits, family photography, etc. $125 per hour, with a 2 hour minimum. All prices subject to change. Official price is given upon reservation. Rental fees include Caterer’s use of china, silverware, glassware, tables, and chairs. Deposit: A $500 damage deposit is required 30 days in advance of the event. The deposit will be refunded if Mansion and grounds are left as they were found. Security: A security officer is required to be onsite for all evening events. Officer fees are charged at a rate of $42 per hour with a minimum of 4 hours. 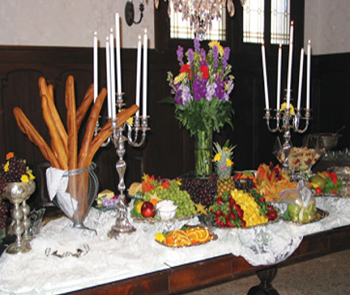 The following caterers are approved for use at the Alexander Mansion.